Any document starts with a heading. You can use different sizes for your headings. HTML also has six levels of headings, which use the elements <h1>, <h2>, <h3>, <h4>, <h5>, and <h6>. While displaying any heading, browser adds one line before and one line after that heading. Whenever you use the <br /> element, anything following it starts from the next line. This tag is an example of an empty element, where you do not need opening and closing tags, as there is nothing to go in between them. The <br /> tag has a space between the characters br and the forward slash. If you omit this space, older browsers will have trouble rendering the line break, while if you miss the forward slash character and just use <br> it is not valid in XHTML. You can use <center> tag to put any content in the center of the page or any table cell. Horizontal lines are used to visually break-up sections of a document. The <hr> tag creates a line from the current position in the document to the right margin and breaks the line accordingly. 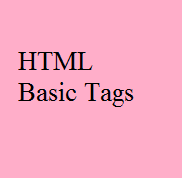 Again <hr /> tag is an example of the empty element, where you do not need opening and closing tags, as there is nothing to go in between them. Sometimes, you want your text to follow the exact format of how it is written in the HTML document. In these cases, you can use the preformatted tag <pre>. Any text between the opening <pre> tag and the closing </pre> tag will preserve the formatting of the source document. An example of this technique appears in the movie "12 Angry Men."